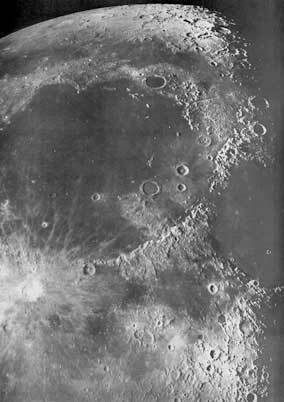 Right: Image of the Moon taken during the Lunar Mapping Project at SRO as described below. Over 13,400 high resolution images were taken on 35mm and 70mm motion picture stock. The camera and film were supplied to SRO by Lockheed-California Company and the Jet Propulsion Laboratory for this project. 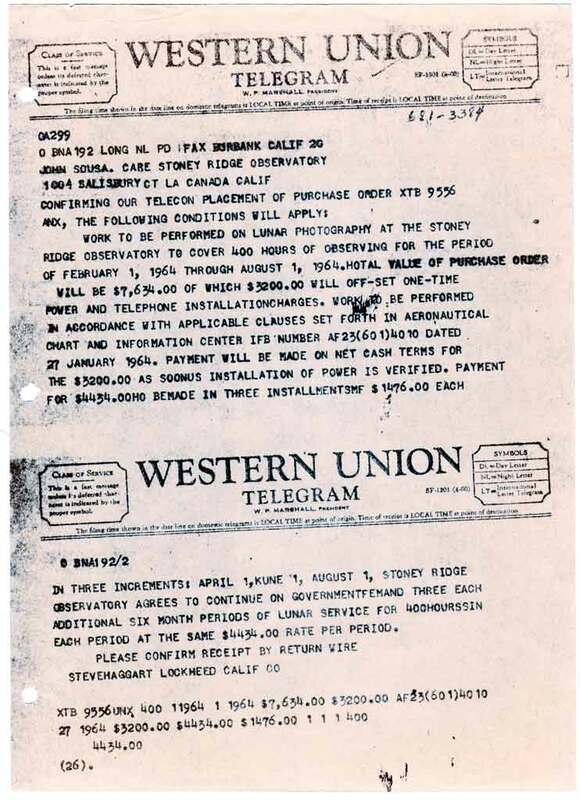 1963 - Up to this point in the history of Stony Ridge Observatory (SRO), the observatory was built and financed solely on the backs, and from the wallets, of the original 15 members of the Association of Amateur Astronomers (AAA), as SRO was known in those early years. At the many design/construction meetings held in the members' homes, exactly how they would continue to finance such an undertaking was always at the top of the agenda. The family burden must have been extraordinary. At a certain point during the SRO construction, the successful completion of the observatory seemed in jeopardy, available funds were quickly drying up. This SRO milestone occurred during the era when the United States was approaching one of its own milestones, the preparation of a spacecraft mission with the goal of, in the words of President Kennedy, "landing a man on the Moon and returning him safely to the Earth." 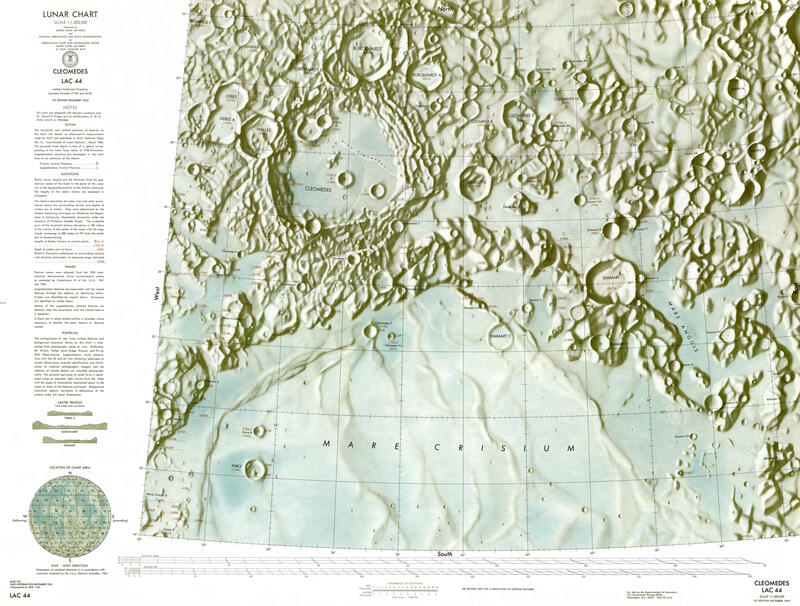 Lockheed-California Company had signed a contract with the Aeronautical Charts and Information Center (ACIC) in St. Louis (a section run by the United States Air Force), by which an agreement was made that Lockheed would supply high-resolution images of the lunar surface to the ACIC for the production of lunar charts that would be used in determining possible landing sites on the Moon for the Apollo astronauts. Lockheed then faced a dilemma of its own, where could they find a large amount of telescope time at an observatory to fulfill their contract with the ACIC? At that time, three AAA/SRO members, George Carroll, Norrie Roberts and Chuck Buzzetti worked at Lockheed-California. Presumably, through these employee contacts, Lockheed became aware of the nearly completed Stony Ridge Observatory. SRO and Lockheed entered into a contractual agreement, by which Lockheed would pay SRO for its power and telephone installation costs, plus an amount for 1600 hours of observing time on the new 30-inch telescope, over a period of 4 years. Some of the payment from Lockheed would be paid upfront, so that the construction at SRO could be completed. The contribution from Lockheed, over the 4 years of the Lunar Mapping Project, totaled close to $21K. Thus, the freshly completed observatory commenced its Lunar Mapping Project officially on February 1, 1964. SRO provision: 1600 hours of telescope time provided by SRO observers, John Sousa, Easy Sloman, Roy Ensign and Norrie Roberts; assisting the Lockheed P.I.s, Larry Stoddard and Don Carson. "Buzz" Aldrin on the lunar surface and returned them, along with Michael Collins, safely to the Earth on July 24, 1969. We of the present-day Stony Ridge Observatory will always look back, with pride and reverence, to our founders for their contribution to the success of the Apollo missions and to the United States of America.